Recently a very dear and truly wonderful friend fell ill - she fell down and badly injured her spine, and was hospitalized for 3 weeks with months of therapy yet to come. 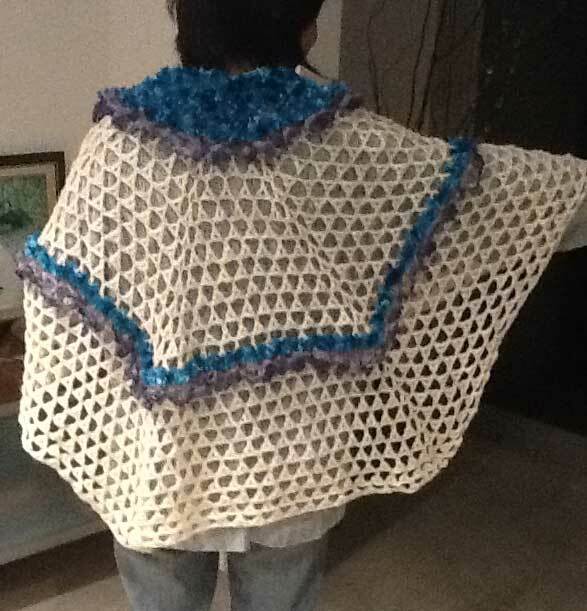 So I thought some handmade crafts made with love would cheer her up and help accelerate her recovery. Some wonderful, caring, and generous ladies from Australia's Beading Forum sent their love as well as generously contributed yarn towards the making of these gifts. 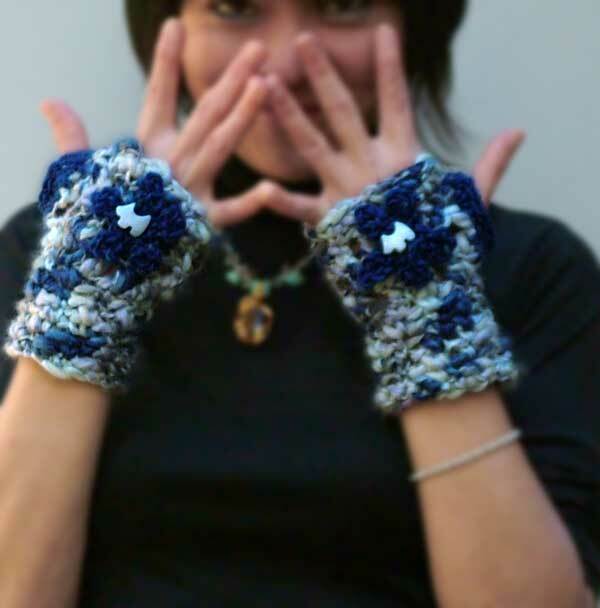 These yarn were generously contributed by Caroline Fung, Barbara (BJO), and gieniegal. Abbey also contributed lots of yarn - unfortunately by the time I received it, I had pretty much finished the project and was making ready to photo, pack, and send. But much appreciation is sent out to Abbey as well as the other wonderful ladies. Others are even now making knitted/crochet squares to create a knee rug for Bev. She is a much loved lady and deservedly so. Here I am just going to document the progress of my part in this labour of love project. It is really more for my own record and memories than anything else. Starting with some work in progress shots, the following two photos show the base shawl with the collar and mid-trimmings completed. The main yarn is in cream and is 100% wool, handspun, from Nepal. This next shot is me trying to layout the flower arrangements. They are meant to be randomly arranged. This begins to give me some idea as to how the final layout might be like. 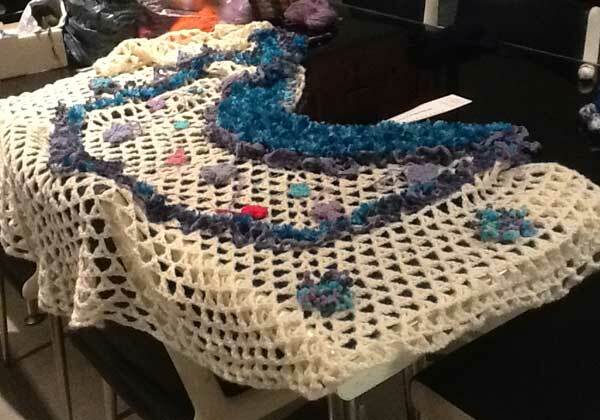 Each of the flowers are individually crocheted flowers. A tedious process I must confess - especially the neatening up and the sewing on!! I am afraid I have to model this myself as there is no one else available. This next photo shows the front. 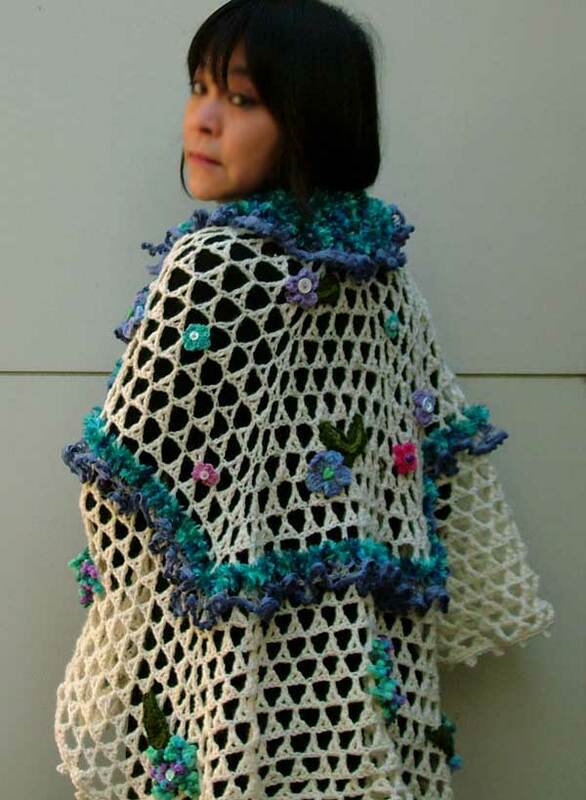 The flowers now have crocheted leaves as well. Each flower and leaf has to be sewn down around the edges as much as possible otherwise it will look all shrunken up. Though it is not immediately obvious from the photos, each flower has a button as its center. 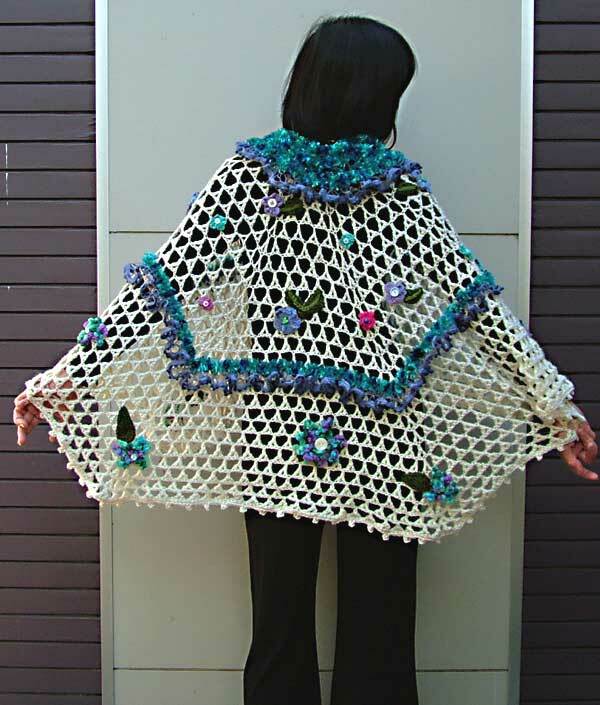 The shawl has a front tie for ease of wear. These next 2 photos show views from the back. 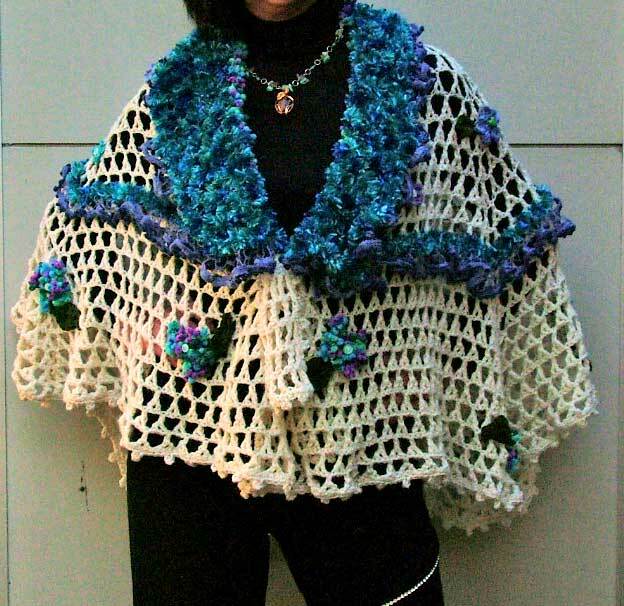 Ideally I would have preferred to put many more flowers on the shawl. However I must say that I am rather tired out by all the little pieces that have to be made and assembled. Plus I want the pressie, with all the good wishes from her friends, to go out to Bev ASAP. So I am forcing myself to stop adding more flowers. This way - I think it looks pretty ok and I can send it out (to USA) before the week is up. The sooner I can send, the sooner it can get to Bev. 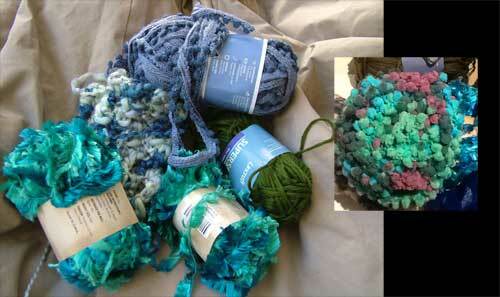 In the yarns that were sent to me - I did have a bit of a problem trying to put the colors together. Out of the yarns received, I chose one that I had particular difficulty with, colour wise. I couldn't quite envisage it going with the rest of the colors I had received. This was a lovely, fluffy, soft ball of yarn from Caroline Fung. 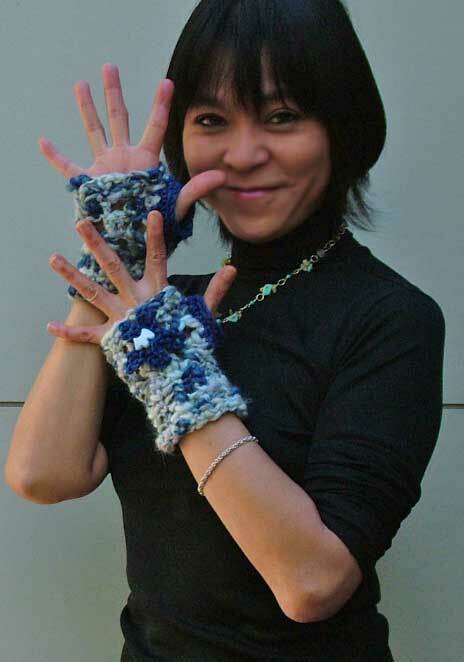 It seemed to me that it would be a perfect yarn to make a pair of fingerless gloves for Bev. So that is what I did. Because I had only one ball of this yarn, I attempted a few patterns initially but they all ate up more yarn than I had available. Fortunately I was able to find a stitch - albeit an open stitch - that was just perfect for that one lovely ball of yarn. I embellished it with some blue yarns for the flower and thumb-edging. That's it! 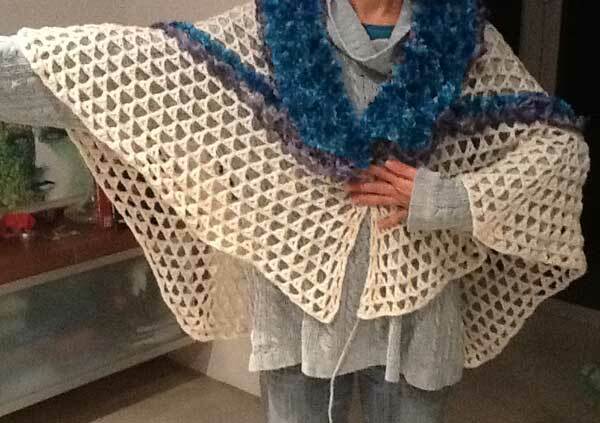 My many thanks to all the ladies at the Beading Forum who have so lovingly and generously contributed yarn and sent well wishes and love to Bev. 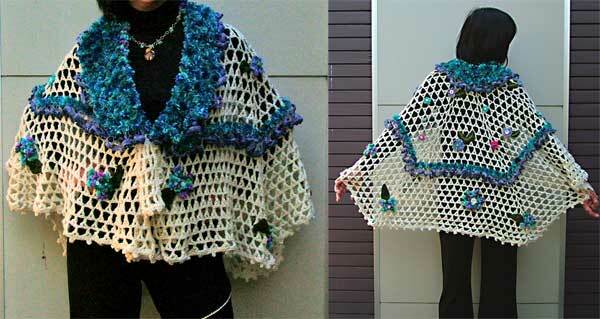 Now the parcel can speed it way, cuddled in yarns of love, to dearest Bev in USA. Wishing her a strong and speedy recovery.